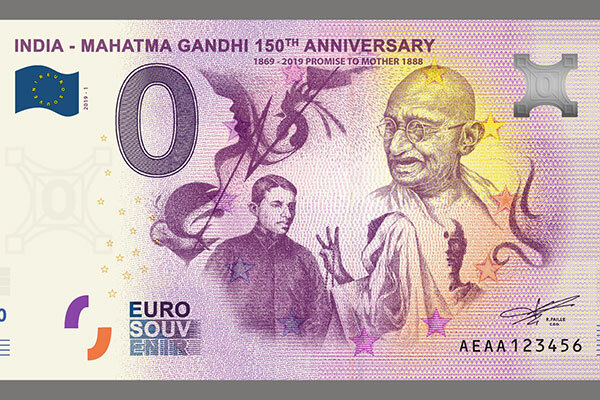 UAE-based specialized numismatics company Numisbing has unveiled the first-ever Euro Souvenir Indian notes celebrating the 150th year of Mahatma Gandhi’s birth anniversary. The limited-edition Zero Euro 12–notes are being issued with just ,5000 notes of each design. The first two notes of the series are launching now and the rest sequentially until Oct 2, 2019. Ramkumar, founder of Numisbing and president of International Bank Note Society, Dubai Chapter said: “Besides the fact that these commemorative notes have a huge shelf value, the bigger reason for the initiative was to bring Mahatma Gandhi back to life using incidents that are more than just history lessons. Only once before a similar initiative has been taken when the Indian government issued commemorative notes with the image of Gandhi in 1969 to celebrate his 100th birth anniversary. These notes were for public use as well”. Ramkumar, a collector himself, also has his name recorded in the Limca Book of Records as the person having the unique collection of commemorative banknotes – 45 –issued for Mahatma Gandhi’s centenary in 1969. He has all denominations and all prefixes – 18 Rs 1 notes, five Rs 2 notes, seven Rs 5 notes, 13 Rs 10 notes and two Rs 100 notes.